Cohda Wireless, a global leader in autonomous V2X technology, will receive two grants totalling up to $2 million from the Future Mobility Lab Fund to conduct on-road trial projects on the streets of Adelaide to test how vehicles communicate to one another and with roadside infrastructure, as well as expanding the Cohda’s work in ‘Vehicle to Everything’ communications (V2X). Cohda Wireless, is a leading supplier of Vehicle-to-Vehicle, Vehicle-to-Infrastructure and Vehicle-to-Pedestrian - collectively called V2X - Connected Vehicle solutions, is now developing CAV solutions for carmakers, smart cities and mining. 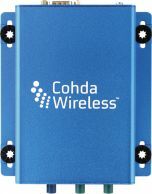 Cohda Wireless’ CAV products focus on solving key outstanding problems for CAV deployments: CAV localisation, CAV sensor fidelity, and CAV system cost. The grant will be used to acquire two autonomous vehicles capable of driverless operation in urban and highway environments to test the company’s CAV applications. Cohda will also deploy a network of its V2I road side units on the streets of Adelaide’s CBD for testing CAV solutions as part of the trial. Cohda’s products are used widely in locations including the USA, Europe, Australia, Japan, Africa, Middle East, China, Singapore, Taiwan, and Korea.